Look, Gaming Heads, I know you're all excited about introducing the new Tomb Raider line to the public, but who is going to buy a $340 statue that's all covered in dirt, bruises and blood? Show a little self respect, dammit. I mean, it's not like you missed the dirt and blood and such. This is a 1/4 scale figure — that's 20 inches tall from the base. Surely someone noticed the hero of the latest iteration of the long-running action-adventure series looked as if she'd just been on a long-running action-adventure. Is that fresh blood on her shirt? Who the hell modeled for this? Is she okay? Did she get medical attention? Look, Gaming Heads. Now I am worried. That's not how these mailings and press releases are supposed to make people feel. 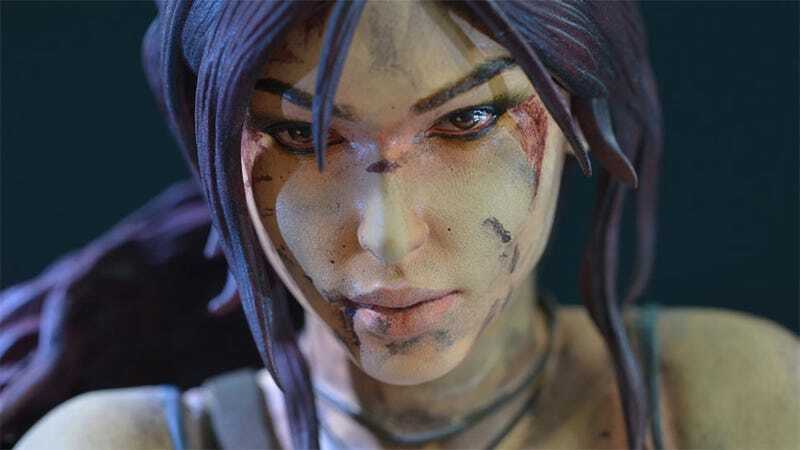 The goal is to make people want to purchase one of the 1,000 piece run of Lara Croft Survivor statues for $319.99, or maybe even drop an extra $20 on the exclusive version, which comes with a combat shotgun and is limited to only 500 pieces. Instead, I just want to go check on my loved ones, and make sure they are safe and clean.